Ever wonder what it would be like to ride a horse, but not ready to commit to a full session? Or does your bucket list have "Ride A Horse" near the top? If this is you, or someone you know, a One Time Ride may be the answer. RFJ offers a one time riding experience by appointment. 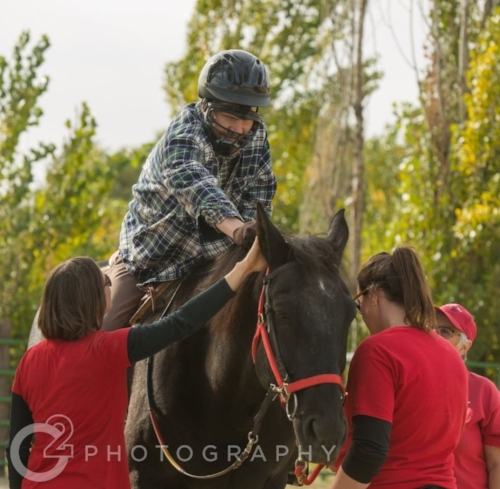 The event will last approximately an hour and a half and will include an evaluation by staff to determine the appropriateness for riding and equine and tack assignment, a barn tour of the program, and approximately 45 minutes of ride time facilitated by RFJ staff. Cost is $50 per rider. A New Student Application must be completed and returned to RFJ to schedule an event. Applications can be faxed to 208 550-3208, emailed to hminer@rideforjoy.org or mailed to PO Box 140295 Boise, ID 83714. Riders who wish to return and participate in a full season must wait for one complete session before being added to the active rider list. Please contact Heather Miner at hminer@rideforjoy.org with questions or to schedule a One Time Ride.